Our business is fully registered with the state of Texas, As well as our scales. If you are unsure on the way to sort and separate scrap metals/electronics we can show you how to sort it ONCE as sorting it for the customer costs us money. 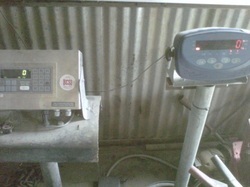 These are the scale indicators both registered and calibrated by the state and a scale company. The silver one on the left weighs up to 10,000LBS and the blue one on the right weighs up to 5,000LBS. And are in clear view to the public. Know what you weigh? Hop on! Texas state regulations and rules. 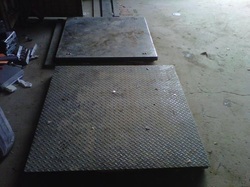 Due to the mass theft of metals the state of Texas REQUIRES that any registered and legal scrap yard that buys regulated material must take a VIDEO/PICTURE of the material and seller, and copy the sellers Drivers License/ID and right down the sellers vehicle information including Make, Model, Color, Year, And plate tag number. ALL INFORMATION AND PHOTOS/VIDEOS WE GATHERD FROM SELLERS WILL NOT BE USED IN ANY FORM OR FASHION OTHER THAN WHAT IS REQUIRED BY STATE LAWS AND REGULATIONS. Scraping your electronic equipment is much more simple than scraping your metals, Electronics do not have the regulations that metals do, so when you scrap your electronic equipment we do not require an video/photo of the seller and materiel. We buy just like any other scrap yard, but some things we buy per unit therefor there will be some items that we will not weigh such as, NON CRACKED LCD monitors/LCD/Plasma TV's, CRT Monitors.